A quilting bee is a lot like our work bee. You gather up a crowd of people–well, the people in your home–and you work together until the job is done. One person cleaning a messy home from top to bottom can be a massive undertaking that takes a significant chunk of time–5 people tidying up a dirty house takes a lot less. Why 5? Well, that is how many people in my family, you might have more or less helpers available. If your helpers are too little to help in such an undertaking, have them cared for elsewhere while you and your husband work together to get the housework caught up. 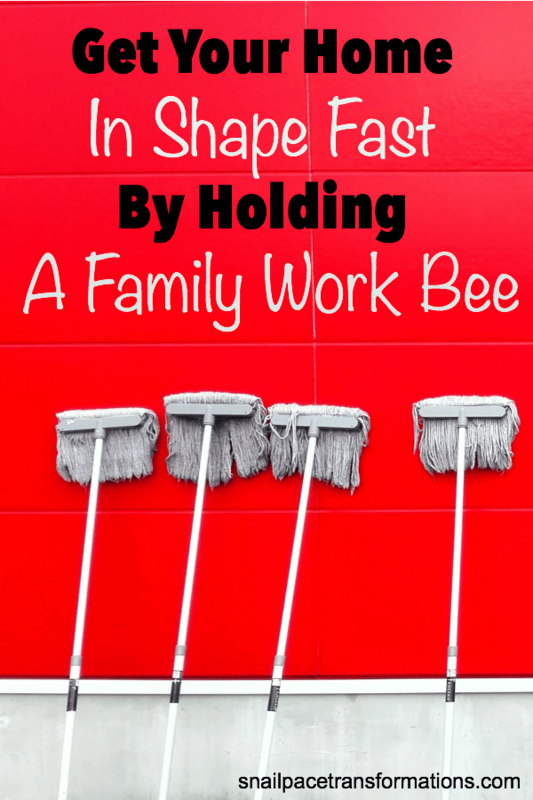 For instance, my husband and I once enlisted the help of family and friends to watch the kids for two days when they were tiny while we decluttered and cleaned our home to get it ready to sell. In those two days, we removed two truckloads of no longer needed items and cleaned and organized what remained. After such a clean up I felt like my days were longer. They weren’t; I was simply no longer spending time sifting through, digging in, and cleaning around piles of clutter. Preferably at least a day in advance go through each room of the home and write down what needs to be done in that room. This will become your master plan for cleaning day and will make it easier to divide up the work before you get started. Once you make up your plan, go through it and divide up the chores in the fairest way you can. What children can do will of course depend on age, so try to give the smallest members of the household the simpler chores and the older ones the more complex ones. I like having two brooms and dust pans and enough cleaners for everyone. I also make sure I have plenty of clean rags. 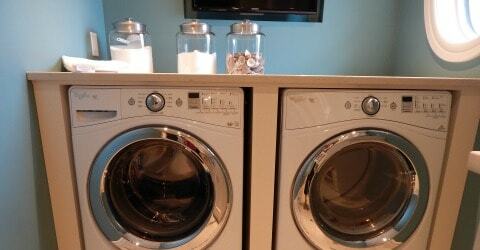 Super Washing Soda: mix a quarter cup of super washing soda in a cleaning bucket filled halfway with warm water. Use it to wash grime and finger prints off of walls and cupboard doors. Rubber gloves: super washing soda can be hard on hands. Use rubber gloves to protect them. Scrub brush: I really like how this scrub brush fits in the palm of your hand and since it is also a soap dispenser it makes less mess. This helps the children know that Saturday won’t be a play day. I give each child a written list of chores and tell them that they may be asked to do more if needed. I also give them a firm cut off time so they know when we will be stopping. Lastly I announce the prize for the day. Usually it is pizza at their favorite restaurant, followed by a Netflix movie enjoyed with dollar store candy. I am usually the director on working bee days. I clean too, but I also take time out to check the children’s work, show them how to clean something correctly or get them back on task if they are getting distracted. I mentioned this in point four, but I thought it needed to be a point of its own too. Work bees go so much faster when you know that there is something fun at the end of them. It doesn’t have to be expensive; it could something as simple as having another family over who has children your children love to spend time with. This post is part of the 31 Day Time Management Series. Dig further into the series using the links below! Day Two: Night Owl Or Morning Bird? Day Three: Where are Your Largest Windows? Is daily life just a bit overwhelming? Feel like you are going all day long, but at the end of the day you have little to show for it? 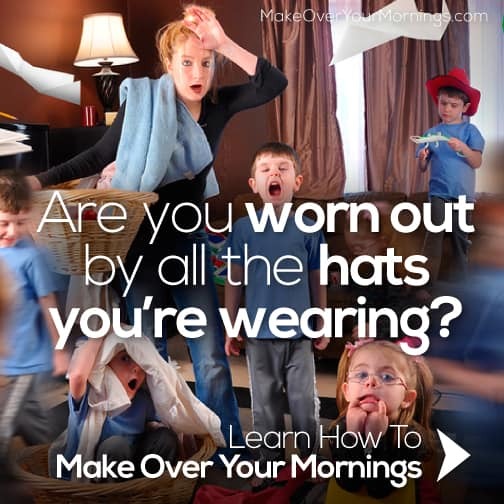 Check out Crystal Paine’s course Make Over Your Mornings. With just 15 minutes for 14 days, this course can shape up your days from overwhelming to enjoyable (well, at least most of them. We all have overwhelming days sometimes–no matter how good we are at time management). Because I don’t have clutter and am able to clean in no time I almost feel guilty that I have time on my hands for fun. I have to stop and look to make sure I didn’t forget something. I have always been an organizer and clutter free so this is second nature to me. I am also lazy so it would take to much to clean.